If you are following some of the biggest names in the PHP scene you may have seen that Zend Optimizer+ is now open-source on Github at https://github.com/zend-dev/ZendOptimizerPlus and it seems that will be included in PHP 5.5 distribution. This is awesome news as we will finally get a PHP Accelerator bundled with the main language distribution and there should not be (let’s hope) weird issues like the ones happening in early versions of PHP 5.4 with APC that has prevented massive adoption of the new stable version of our favorite language. There are some really promising performance tests available here but at the time of writing this post there are neither Symfony2 nor Zend Framework 2 benchmarks so I decided to grab the extension and do my own performance tests. What is tested? Basically the simplest application you can develop with Symfony2 (Version 2.2.0). Please note that to make this last test work properly, you should have your Symfony2 cache warmed before the test if you are using annotations. Otherwise these settings will make your annotations get ignored! First of all, I would like to say that these results must be taken with a pinch of salt as they were made in my personal laptop which is NOT a production server. Operating System is MacOSx so they might differ a little bit on a Linux machine prepared for production. – With composer autoload optimization we might get a benefit of ~20-25% even with a small test like this. Don’t forget it in your production environments!. However, disabling xDebug made this benefit get reduced to ~10%. – With apc.stat set to Off, we get an extra boost of ~8-10% even in such a small test. This gets bigger when the amount of files opened increases. Don’t forget to consider it. However, remember that whenever a change is uploaded you should reset APC so that your changes are noticed. – Xdebug make things SLOW. However, most of the % are similar, except maybe the performance boost with composer autoloader optimizer. Please check that you have not it enabled in your production servers! 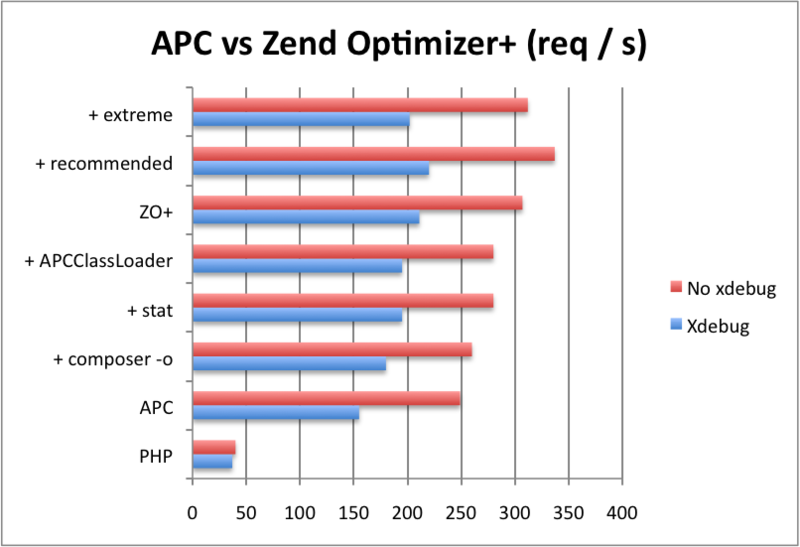 – Zend Optimizer+ is faster than APC, even with the default installation. With recommended settings and in the best scenario we get our requests to be 10 times faster than PHP with no Accelerator! – With recommended settings we get a performance boost of ~11% with xDebug and of ~15% without it, if we compare with APC best performance, but there seems to be something wrong with the extreme settings which were getting worse performance. This was consistent in 5 test I did in different moments, so it seems we can discard that there might have been some background process consuming CPU. – Is it worth to switch? Well, it depends, at least at the moment of writing these lines. If you are not using APC as a local storage cache, it seems that you will get an extra boost for free, which is always good. Also, if it is bundled with the standard distribution, there is one less PECL package to get into account for automated machine deploys. However, if you are using APC as local storage in your application, I don’t think the performance boost is worth if we’re losing the easy caching that APC provides. – As Lukas Smith states in his comment, there is some work being done with ApcU (which can be seen at https://github.com/krakjoe/apcu) which will be APC minus the byte choice cache. If they make it, with the launch of PHP 5.5 we will have an optimizer bundled with PHP and we will still be able to install ApcU. This will allow us to benefit of the performance boost in ZO+ while not losing APC storage and upload files hook. It definitely seems PHP 5.5 will be another amazing version of our favorite language with Generators and Zend Optimizer+ being the biggest improvements! Please, feel free to add any comments to these tests! I’ve added this in the blog entry, thanks Lukas for sharing it! Thanks for doing these benchmarks. Interesting results! Thanks for the benchmarks, really interesting.ZO seems to be really efficient. I tried on my website and my dev VM and it doesn’t work too. Google is just as example. Oh ok, sorry, then the only thing that comes into my mind is there is some problem in your local Apache installation. ulimit is for your local open resources, having ab with -c 10 parameter would only create 10 concurrent connections on your side. Seems like this bug was introduced in lion and still exists. I believe for real applications testing -H “Accept-Encoding: gzip,deflate” option should be added. It’s very helpful article, thanks! Can You attach your APC config from your test? The only exception was apc.stat value that was changed in some tests to show the performance difference between On and Off.